A Derby brewery has broken through its £5,000 crowdfunding target after receiving a £2,500 pledge from local farm shop Croots. Pub entrepreneurs George Lambert and Walter Scott, who own a micropub in Derby and a pub in Burton, launched the appeal in the hope of raising £5,000 to grow their original venture, Wentwell Brewery. The pair ran the crowd funding appeal through Crowdfunder, a website that allows the public to donate money in return for rewards….in this case ale. With less than a week to go before the 28-day deadline, Wentwell Brewery had been pledged £2,850 of the £5,000 target. 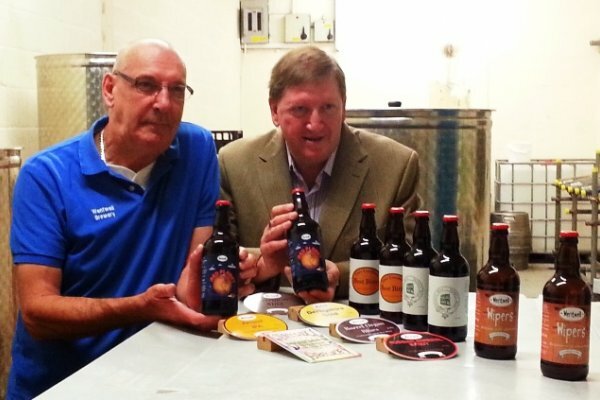 But when Steve Croot, owner of Croots Farm Shop, based at Duffield in Derbyshire, heard about the venture he stepped forward and pledged a further £2,500, which has taken the brewery past its target and now means the project will go ahead. Real ale fan Steve Croot said: “It’s a win, win situation. Wentwell Brewery can go ahead with its expansion plans. Croots Farm Shop can stock additional beers, and our customers will benefit by being able to buy more ale from a local brewery. Steve’s pledge will entitle him to hundreds of bottles of beer which he will add to the range of local beers already on sale at Croots. The project will allow Wentwell Brewery to buy a hot liquor tank and a new heat exchange unit, which will increase the efficiency of the existing plant and allow the brewery to sell more ale to the free trade.